Marine aluminum sheet is one of the emerging field of aluminum alloy products, now comes to be a rising trade which has a complete range of sizes, both the currently the focus for the process of transformation and upgrading of numerous domestic aluminum processing enterprises direction. Marin aluminum sheet is being used in areas such as ocean shipping. Thus, comparing with those of other ordinary aluminum alloy products, strict requirements of the requirement of process and the performance standards were necessary in marine aluminum sheet applications. Marine aluminum sheet material selection principle can be divided into four aspects. One is with high specific strength and specific modulus, ship structural strength and size and material yield strength and elastic modulus are closely related, And since the elastic modulus has roughly the same density as aluminum alloy, little additions of alloy elements makes very little difference, to improve the yield strength is good for reduce the ship structure in a certain range. High strength aluminum alloy is often difficult to have a combination of excellent corrosion resistance and weld ability. So Marine aluminum sheet are generally moderate intensity, corrosion resistant alloy welding strength, and corrosion resistant alloy welding. The second is excellent welding performance. At present, tungsten inert gas (TIG) welding method is one of the most widely used methods for its advantages of economy and convenience. Good weld ability means aluminum alloy formed during welding crack trend. That is to say, Marine aluminum sheet will have good aluminum alloy welding crack resistance. Because under the condition of shipbuilding can’t through the welding performance of heat treatment to restore lost again. The third is the excellent corrosion resistance performance. The response of off seawater medium and marine environment under the environmental load is very complex. Therefore, the corrosion resistant performance is the main sign of marine aluminum sheet. Four is aluminum alloy with good cold and hot forming performance, because the ship to the cold and hot working in manufacturing a variety of processing, So the marine aluminum sheetmust be easy to processing molding, do not produce crack defects, and processed still can satisfy the requirement of strength and corrosion resistance. · Selection principles of marine aluminum sheet are stricter. At present comparatively uses is 5083、5086、5454、5754、6061 etc. In practice, the advantages of marine aluminum sheet are very obvious. 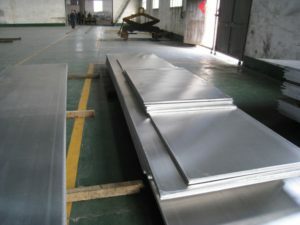 First is the proportion of small, can reduce ship heavy, saving energy consumption, increase capacity; Secondly, good corrosion resistance, reduce the cost such as oil, prolong the use fixed number of year; Three is the number of welding, machining formability, conducive to the late processing; The last one is aluminum scrap recycling easily, can be recycled, at the same time, not burning, fire safety.